Held yearly for centuries, the Ocean of Fire--a 3,000 mile survival race across the Arabian desert--was a challenge restricted to the finest Arabian horses ever bred, the purest and noblest lines, owned by the greatest royal families. In 1890, a wealthy sheik invited an American, Frank T. Hopkins (Viggo Mortensen), and his horse to enter the race for the first time. During the course of his career, Hopkins was a cowboy and dispatch rider for the U.S. cavalry--and had once been billed as the greatest rider the West had ever known. 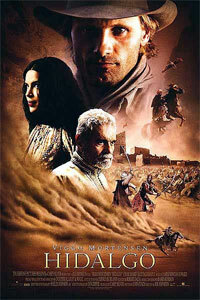 The Sheik (Omar Sharif) puts his claim to the test, pitting the American cowboy and his mustang, Hidalgo, against the world's greatest Arabian horses and Bedouin riders--some of whom are determined to prevent a foreigner from finishing the race. For Frank, the Ocean of Fire becomes not only a matter of pride and honour, but a race for his very survival as he and his horse attempt the impossible.